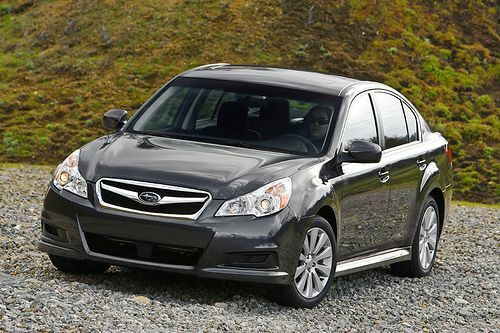 Consumers who are looking for a safe sedan don’t have to look any further than the new 2013 Subaru Legacy. See what top rank the sedan has received. Subaru is building some of the safest cars on the road and consumers who are looking for a safe sedan need to look at the new 2013 Subaru Legacy. Subaru has announced that the Legacy has received the top rank "Five Star Award" in the 2012 Japan New Car Assessment Program (JNCAP) crash safety evaluation tests. And this is the second consecutive year following its 2011 "Five Star Award" that the Legacy has received the award. Safety is not new to Subaru around the globe as the Legacy has also received the IIHS Top Safety Pick in the U.S. In fact, the Subaru brand are the safest cars on the planet and has received IIHS Top Safety Pick awards for every model it builds. In Japan, the stringent tests are conducted by the Ministry of Land, Infrastructure, Transport and Tourism (MLIT) and the National Agency for Automotive Safety and Victim’s Aid (NASVA). The Subaru Impreza has also won the 2012 "Five Star Award" for safety in Japan. What does Subaru do to make the Legacy safe? Safety is not new for the Japanese automaker, as they have been testing their cars since the 1960’s before safety testing methods had yet to be established. The whole Subaru lineup along with the new Legacy has won high praise around the globe for their safety record. The Legacy also received the prestigious five star rating from Euro NCAP in 2009 for the Subaru Legacy. The high safety targets are designed into their vehicles before they ever reach production. The safety targets are set first, and then the design team uses computers to conduct impact simulations. Those results are then incorporated into the new design. Real-world impact simulations are then conducted in Subaru’s own test facility. Hundreds of new Legacy test mules were smashed before the sedan ever reached production. And Subaru even goes beyond what is expected from the various national safety tests around the world. The new Subaru Legacy received the top JNCAP safety ranking in five different categories. They were Driver’s seat/Front passenger seat, Driver’s seat / Rear passenger seat, Neck injury protection in rear-end collision, and Pedestrian leg protection. The new Legacy features both active and passive systems to help get the safest ratings. It features Accident avoidance with vehicle control and risk avoidance features, Occupants protection with crash safety features and Pre-crash detection with advanced driver assist technologies such as warning alarm and pre-collision braking. Subaru is one of the safest brands on the planet and the new 2013 Subaru Legacy sedan can be driven safely anywhere. Its a good choice for consumers who want one of the safest cars in the world. Watch the 4th-generation Forester safety development to see how Subaru designs safety into their cars.